Aer Lingus today announced a new North American route from Seattle to Dublin which will be Ireland's first ever direct service from the Emerald City. The Airbus A330 offering both business and economy class services, will operate four times weekly from May 18th, 2018 on Monday, Wednesday, Friday and Sunday. Seattle has strong business links to Ireland, boasting a vibrant technology sector which is home to some of the largest technology companies including Microsoft and Amazon, both of which have significant operations in Ireland. The Irish based aircraft leasing sector will now be connected directly to the home of Boeing, and Seattle is also home to the world's largest coffeehouse chain Starbucks. Since joining IAG in 2015, Aer Lingus has launched six new direct transatlantic services: from Los Angeles, Newark, Hartford, Miami, Philadelphia and now Seattle, marking the largest ever transatlantic expansion in the airline's history. Seattle adds 50,000 additional seats to the airline's transatlantic programme for summer 2018, with total 2018 transatlantic capacity now reaching more than 2.75 million seats. The airline's fleet and employment will expand significantly over the next five years with the acquisition of Airbus A321Neo long-range (LR) aircraft from 2019. 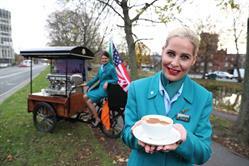 This aircraft type will open up new markets, expand the network and enable a new growth phase for Aer Lingus. Strengthening its Dublin Airport base as a major European transatlantic gateway is a primary focus for Ireland's only 4 Star airline. This strategy delivers increased connectivity for Ireland which supports international trade and economic development, as well as growth in tourism. It also highlights the gateway connections available at Dublin from North America to the UK and Europe, and the convenience of U.S Customs and Border Protection services at Dublin Airport on the return flights to the U.S.
From Seattle, Aer Lingus will offer 24 seamless connections, via the Dublin Gateway, to UK and European cities such as London, Paris, Rome, Brussels, Amsterdam and Frankfurt. "We are delighted to announce Seattle as our latest transatlantic route for summer 2018. We believe this service will offer great value choices to our guests and further enhance Ireland's trade and business links with the U.S. Since joining International Airlines Group some two years ago we have grown and strengthened our Dublin Gateway to North America and we look forward to continuing this development in the years to come." "Dublin was the largest European destination without direct service from Seattle -- now our luck has changed! Both cities are well-known for their booming tech industries with Washington State-based companies making significant investments in Dublin, while at the same time this route will provide additional choices for our region's travellers." Aer Lingus is the national airline of Ireland, founded in 1936 who primary mission is 'To Connect Ireland to The World' by providing customers with convenience, choice, comfort, value and seamless transfer options - making Aer Lingus the smart choice. It is Ireland's only 4-Star airline having received a 4-Star rating from Skytrax, the international air transport rating organisation, in July 2016. With its fleet of 63 aircraft, Aer Lingus operates from central airport locations in the UK, Continental Europe and North America on over 100 routes, carrying 12 million customers per annum. Guests can choose from 13 North American gateways and connect via Aer Lingus' home base in Dublin Airport to more than 75 onward destinations across the UK and Continental Europe. Dublin Airport is the only major airport in Europe to offer U.S preclearance, which enables passengers to save time on arrival in the U.S by completing all the necessary immigration and customs checks prior to departure.